Maybe the big day is past, or perhaps the date is yet to come and you are pro-actively thinking about the future. Wherever you are in relation to your wedding day, you are reading this because you want to know how to perfectly preserve and store the most expensive clothing purchase you’ve ever made, or are likely to make (unless you are a Kardashian, and even then, you’ll want to get this right, Kim and/or Khloe!). At home or in a climate-controlled self storage unit at Space Shop, the following guidelines will help you keep your special garment looking fairytale fresh for happily ever after. While having your dress cleaned can wait until after the honeymoon, it is ideal to have it professionally cleaned as soon as possible. You could add this task to the pre-nuptial to-do list, and politely designate someone to get it to a cleaner that has experience with wedding dresses. (Another good idea: interview your dry cleaner well in advance to be sure that they do this sort of thing.) Here’s the reason for haste: stains set quickly – and not only red wine. Oily spots will discolor fabric and even sugar left on the material will turn it brown. Your dry cleaner will box up your dress after it is cleaned, unless you want to do it yourself. The best way to store your wedding dress and accoutrement is in a box, not hanging in a closet, which will cause the fabric to stretch. After the no-closet rule comes the second most important directive: no plastic. Plastic retains moisture, and excessive moisture (ambient humidity above 50%) is bad, bad, bad for stored valuables. Instead, as you tuck the sleeves over the bodice, and tuck the bodice into the skirt, and tuck the skirt into itself, layer lots and lots of acid free tissue into the folds. This will help prevent creases and protect the fabric nicely. When you have tucked and folded and tissued, wrap a length of plain, clean muslin around the dress, and snuggle it into the non-plastic box. 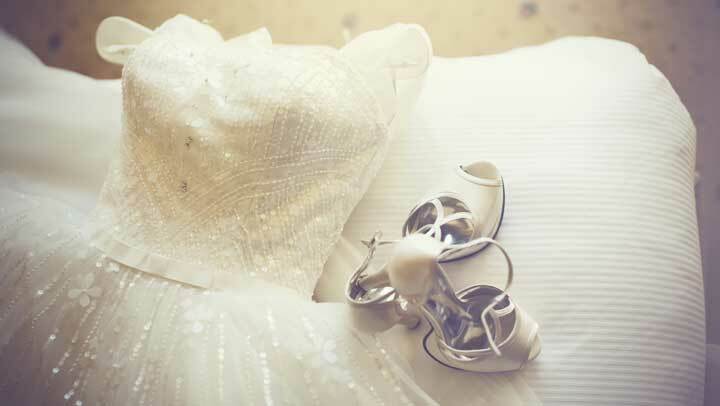 Some brides like to include other items such as shoes and jewelry. Just be careful to avoid catching any beading or lace on a sharp edge. OK, you’ve preserved your beautiful gown, now what? For long-term storage, it is critical to avoid light, excessive moisture, and huge swings in temperature. The garage is probably out. Under the bed could work, unless that’s where the cat sleeps. A shelf in an interior closet would suffice. Best yet, protect your wedding dress in a climate controlled storage room like the ones at Space Shop. Your gown will emerge from its tissue and muslin cocoon looking as lovely and fresh as it did on your wedding day.